In 1884 William Hill and Sons were contracted to rebuild the Organ. In fact, they replaced the majority of stops on the manual divisions, retaining much of Holdich's Pedal Organ. Towards the turn of the century its position in the chapel was felt to be increasingly undesirable. 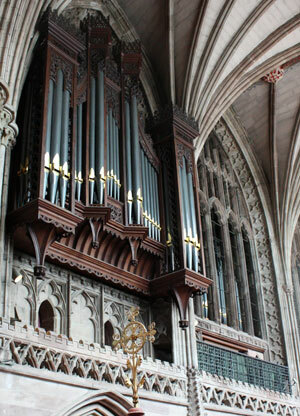 The console was placed in the North Quire Aisle which did not allow great rapport between the organist and the choir, and the sound of the organ had insufficient egress into the body of the Cathedral. In 1907 a new chamber was built outside the Cathedral above the North Quire Aisle, the glass was removed from the windows and the organ resited aloft in the position is occupies today. The organ was enlarged, and a new console provided in 1908. 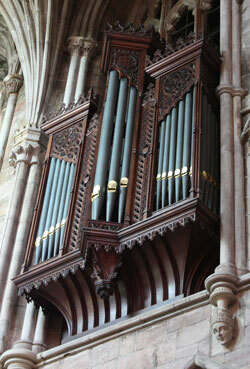 Before the 1908 rebuild, there are records of three earlier organs: Samuel Green's organ of 1789; George's Holdich's of 1861; and William Hill and Son's organ of 1884. Martyn Rawles has written a "very brief" history of the Cathedal organs going back to the fifteenth century, which is available to download here.